What I'm Reading: The Good Luck of Right Now by Matthew Quick | Oh Sarah O ! I'm still in the process of getting caught up on the book club by A Beautiful Mess. 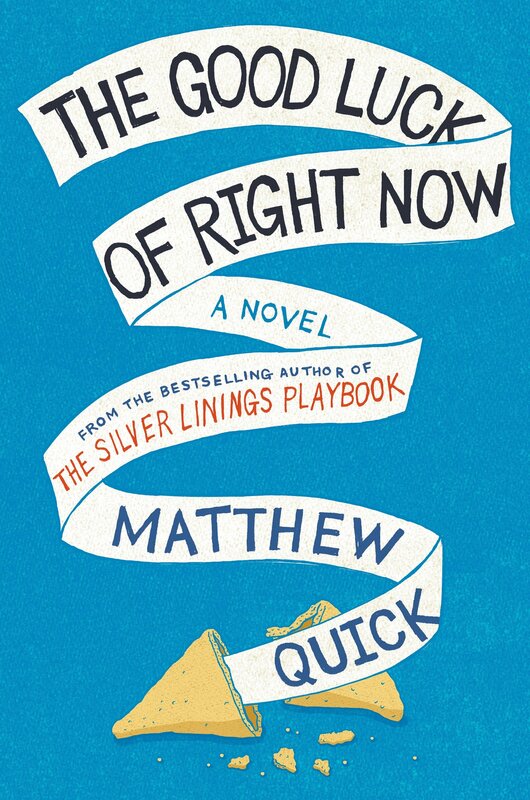 This week I finished The Good Luck of Right Now by Matthew Quick (best known as the author of The Silver Linings Playbook, which was made into a movie that I enjoyed). I absolutely loved this book (in fact, I was kind of sad when I finished the book because I didn't want it to end)! I couldn't recommend this book more. This book follows Bartholomew Neil, a thirty-eight year old man who has never held a job and lives with his mother, who is dying of a brain tumor. The story is narrated through a series of fan letters that Bartholomew writes to his mother's favorite actor, Richard Gere, whom Bartholomew confides in as he cares for his dying mother, entertains new philosophies, meets new people and tries to learn how to live life on his own. I'm going to discuss some points about the book from the discussion guide by Emma from A Beautiful Mess. If you've read the book, you can follow along below. Warning: spoilers ahead! 1. What about you? Do you ever struggle with self-doubt (a.k.a. the little angry man in your stomach)? I think that everyone experiences self-doubt sometimes (maybe some people more than others) and I am no exception. When I'm drawing or DIY-ing I always have some worry that what I'm making doesn't look right, that it's not good enough, and that nobody is going to like it. It'd be nice if during those periods of self-doubt if I, like Bartholomew, also had a Richard Gere voice to coach me on how to be suave and push-through the self-doubt. I guess I need to keep working on that. 2. Did you find the characters in this story believable? We had a bipolar priest who loses his faith, a troubled man obsessed with cats who believes his sister was abducted by aliens, a young woman who had a terrible-sounding mother (feeding her daughter her own pet rabbits for a meal) and then experiences a lot of violence as an adult, and Bartholomew and his imaginary friend Richard Gere. Was it all too much for you? Or did you find the characters believable and charming? I think that having worked in mental health I've come to accept that not everyone has a fairy tale life, so I was able to accept the stories characters as believable. I think the character's quirks made each character more interesting. 3. Father McNamee is one of those characters who can only be described as complicated, right? He's done so much good with his life, being a priest and seeking to help others as much as he can. But then we also find out he abandoned his family for this "selfless" life. What do you make of that? To be a Roman Catholic priest, priests are expected to take a vow of clerical celibacy and remain unmarried. While Father McNamee could have chosen to become a priest in a less restrictive church environment, he chose to be a Roman Catholic priest and thus could not be married nor let it become public knowledge that he indeed had not always been so celibate. That being said, I'm not sure if I would describe Father McNamee as someone who abandoned his family, because he maintained a relationship with Bartholomew and his mother throughout his life- only he did so as their priest instead of as a husband/father. Although it's obvious that Father McNamee had a drinking problem (which seemed to have ultimately lead to his death), it is clear that Father McNamee had a good heart as he selflessly tried to help the members of his church when in need and he tried help Bartholomew after his mother's passing. 4. As the story unfolds, we discover the philosophy behind "the good luck of right now." When something terrible happens, then something wonderful is happening elsewhere, and vice versa. This seems to give hope when bad things are happening (as you can be assured good is happening elsewhere or will happen to you later on), but this is bad news if something good is happening, as you can only assume something bad is happening elsewhere or will happen to you. What did you make of the good luck of right now? Is it another version of karma? Definition- Karma: the force created by a person's actions that is believed in Hinduism and Buddhism to determine what a person's next life will be like; the force created by a person's actions that some people believe causes good or bad things to happen to that person. I thought the philosophy behind "the good luck of right now" kind of sounded like another version of karma. The idea behind "the good luck of right now" is based on the idea that the universe is constantly seeking balance, so if something good is happening to you, then something bad must be happening elsewhere to someone else to balance it out- which I found kind of beautiful. While reading about the philosophy behind "the good luck of right now" I found the idea to be very comforting, much like Bartholomew found it to be for him in the book, but I'm not sure if I'll apply the philosophy to my everyday life (because I'm cynical like that). 5. What did you think of Max's assessment of Cat Parliament—the idea that these cats don't contribute anything important to society anymore but people still take care of them? Of course it's hard not to recognize how Max might think he and his sister (and perhaps Bartholomew) are like those cats. But also, what do you think of this idea anyway; is it kind or just mindless charity? I loved the idea behind Cat Parliament- that although the cats don't contribute anything important to society people still take care of them. Although the cats aren't contributing to society, they continue to bring joy to the cat's caretakers and admirers. In a way, the cats appear to be a metaphor for Max, Bartholomew and The Girlbrarian, Elizabeth, whom are also not contributing members of society at the time they visit Cat Parliament. I think the journey that Bartholomew takes can contribute as testimony to the importance for society to continue to care for non-contributing members who may be physically or mentally disabled or just currently "down on their luck". Although the trio are non-contributing members of society, Bartholomew's existence brought joy and a sense of purpose to both his mother and Father McNamee, helped show Wendy that she was in a bad relationship, literally saved Elizabeth's life and made for a great story. Next, I've already started reading A Beautiful Mess's July book selection #Girlboss by Sophia Amoruso, founder of the clothing website NastyGal. I've heard lots of good things about this book on the web and I'm already finding so much of this book to be inspiring. It seems like it's going to be a quick read. What are you reading? Let me know in the comments below.